The House’s 35th vintage rosé, Grand Vintage Rosé Collection 1999 is a wine of radiant complexity. Mature, intense preliminary notes redolent of aromatic smoke, leather, clove and nuances of wild herbs develop into fruity notes of dried fig and blackberry jam. The palate is expansive and substantial, and the initial roundness gives way to slightly astringent nuances of liquorice for a champagne of commanding refinement. The millennium’s last harvest was the culmination of a year of contrasting and often unseasonable weather. Winter brought an indefinable mix of rain and snow, cold temperatures and warm temperatures, sunny skies and grey skies. Spring was warm and free of frost but hail affected nearly 700 hectares of vineyards in May. June saw hot weather while July and August were stormy. Global drought conditions then prevailed followed by “tropical” weather at the end of the summer, with very high temperatures in early September alternating with quite heavy rainfall. The harvest was a time of near euphoria, as the bunches were very substantial and the grapes were ripe (10% potential alc/vol), healthy and abundant (19,000 kilograms per hectare!). 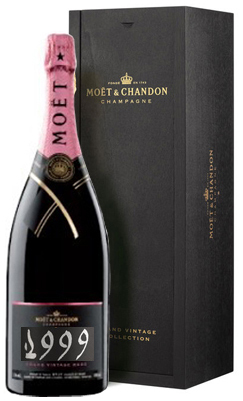 Moet Grand Vintage Rose is an impassioned wine of a deliberate intensity.